PlayerEvals is an online platform that allows coaches to easily create, fill out, and send professional looking evaluations to athletes and their parents. Import players to an evaluation set via CSV or manually add. 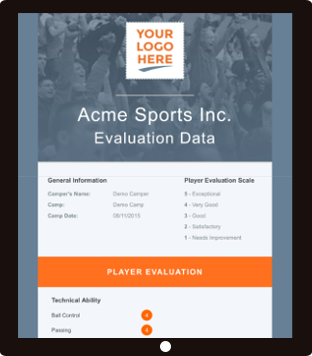 You can customize evaluations with our easy template builder. 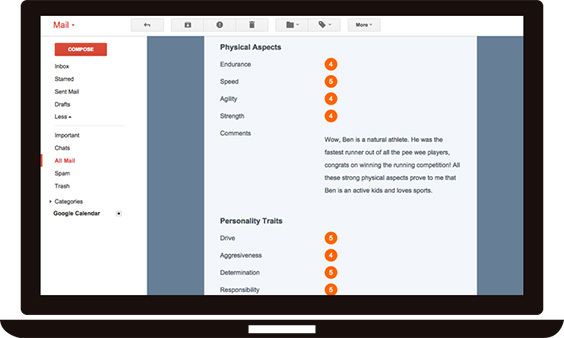 Coaches fill out evaluations from their computer, tablet, or phone. Evaluations can be generic or position specific. Let coaches send evaluations right as they finish or have an administrator do a quality check before they go out. 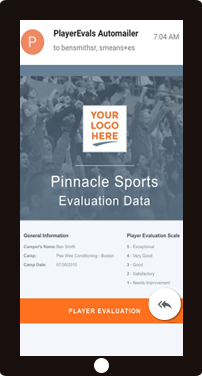 Your players and/or their parents will receive a professional looking email evaluation. Get in touch with us now, we personally talk to all of our customers to ensure you get setup properly. Also, we love to get your feedback. This platform was built by coaches, we want to talk to you about how we can continue to improve. Sign Up Now for a Free Month! We make sure your evaluations look great on everything, from a phone to a full-sized desktop. Evaluations are the main point of contact with your parents. Your logo and your marketing message are presented in an attractive email format. One size does not fit all. 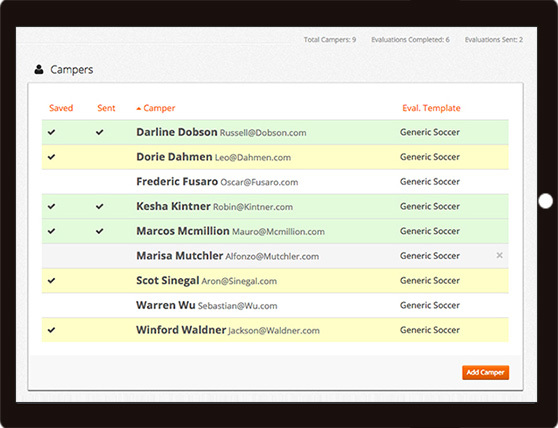 Between different camps and different positions, we let you create custom evaluation templates tailored to your needs. 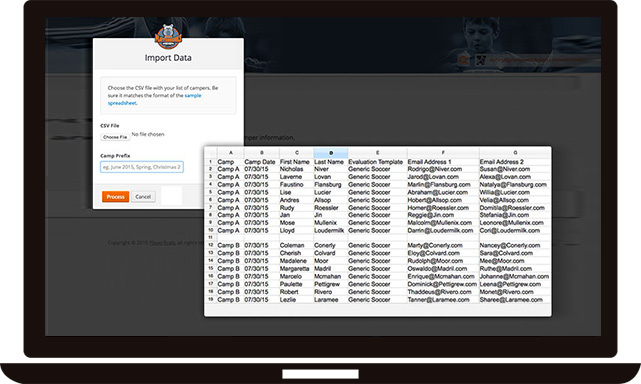 Our evaluation management system makes it simple for you to quality control the feedback sent out by your coaches. Import your list of players directly from a spreadsheet. 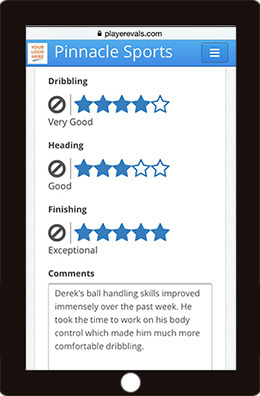 Coaches can fill out evaluations right from their phones. Our mobile-friendly system streamlines your evaluation process. See evaluation status at a glance. Quality check responses as much or as little as your like before the evaluations are sent. Our simple pricing structure let's you focus on developing your athletes. This price is for organizations with less than 2000 athletes. If you have more than 2000 athletes, please contact us for a quote. Sign up now and your first month is free! Interested in PlayerEvals but don't have time right now? PlayerEvals.com is what happens when a professional athlete and a former Microsoft programmer team up to solve a critical task: sending evaluations to athletes. 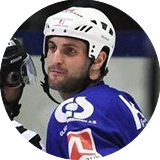 Donny runs a web/software development firm on the East Coast and has been in the hockey world for over 30 years, playing NCAA D1, AHL, ECHL, and in top tier European leagues. As a coach, Donny has worked with kids and adults of all ages and skill levels. It’s Donny’s job to make sure that our PlayerEval system meets the needs of all our coaches, parents, and staff. John played competitive sports his whole life and now works with over 1000 soccer teams a year via his organization, Snap Soccer. As a coach, John started and coaches with a soccer club in FL. John's job is to show how effective and beneficial a good evaluation software can be for any sports organization. © Copyright 2019 PlayerEvals.com. All Right Reserved.